There seems little doubt that Fatal Contact [Hak kuen] is part of a concerted effort by Hong Kong action cinema to retake the martial arts high ground from the likes of Thailand's Tony Jaa, whose brisk and brutal old-school physicality left this former colony's once dominant output dangling from its wire work. Taking its cue from the enthusiastic fan response to Jaa's abandonment of wire-assisted acrobatics and CG effects, the film shakes off the fantasy element of the big budget wushu dramas of recent years and gets pleasingly old school in a modern urban setting, but fires it with 21st century energy. With most of its established stars lured to Hollywood, the search for a new contender has uncovered one Jacky Wu, a fighter of impressive physicality and speed and, if the on-stage opening scene is anything to go by, a one-man advertisement for the training of the Beijing's Wushu Academy. 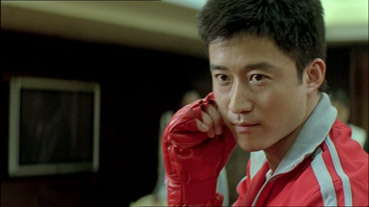 Discovered by director and master fight choreographer Yuen Woo-Ping, who cast him in the lead role in his 1996 Tai Chi Boxer [Tai ji quan], Wu has yet to find that breakthrough project that will launch him onto the international stage, but he's completed six films in the two years since Fatal Contact so has clearly found an audience on home turf. And hey, he's still in his 30s, so there's time yet. The plot is pretty much the martial arts norm, which is to say it has all the complexity and sophistication of a nursery rhyme. Good natured acrobatic theatre performer Kong Ko is approached by gangsters looking to recruit him for their underground fight club. Kong isn't interested, but prospective girlfriend Siu Tin, attracted by the money this could bring in, encourages him to get involved. A fighter of considerable skill, Kong quickly makes his mark and becomes the key weapon in gang boss Fai's ongoing battle with rival Sun, and the threat posed by Wu's opponents increases in line with the size of the bets and the resulting prize money. But just as things get tough, Kong finds help in the unlikely shape of Captain, the comical goon assigned to look after him between matches. Captain is strangely dismissive of his own considerable fighting skills, but agrees to train Kong for the more difficult battles ahead. And yes, save for a couple of later twists, that's about it. Martial arts fans will hardly be slapping their heads with surprise, though it's still rare for a genre film to provide a realistic context for its fighting, the battles here almost all taking place between trained fighters in an organised arena rather than between anybody and everybody in whatever location they happen to collide. Good guys are really nice, bad guys are ruthlessly nasty, and barriers to success are introduced as expected and overcome in predictable fashion – only in the final act does the formulaic norm take a couple of surprising turns, ones I have no intention of revealing here. But we could care less about the plot, it's the fighting we came to see, and that's where the film really delivers. Powered by some adrenaline-fuelled choreography and performed with lightning athleticism by all concerned, the fights build in complexity and brutality until Kong is inevitably pushed over the edge and discovers his own monster within. The wire work and CGI are still there but are almost invisibly incorporated into flow of the action – for the most part the performers do their own thing unassisted, and it's a genre fan's pleasure to watch. Particularly pleasing is the presentation – too often of late even the best martial arts choreography has been lost in a blizzard of fast-changing camera angles, but director Dennis Law gets the balance between pace and clarity just right here, his camera placement and editing speed most effectively showcasing the acrobatic talents of his cast. 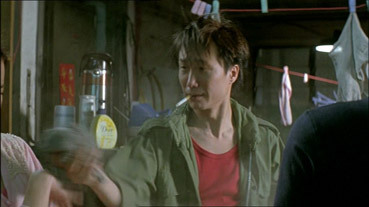 Fatal Contact may not be the genre show-stopper required to re-establish Hong Kong as the centre of the martial arts movie universe, but it's a workmanlike step in the right direction and proves an effective promotional platform for the on-screen charisma and fighting skills of his talented lead. It's unlikely to win the genre a legion of new fans, but does provide some welcome tonic for the troops. And things were going so well. Before I get to my principal moan I can confirm that this is a pretty good anamorphic transfer with OK colour and contrast, but does lack detail in darker areas and is never as crisp or punchy as you feel it should be for a two year old film. The problem here – and it is a problem – is the aspect ratio. Fatal Contact was shot 2.35:1, but for reasons I cannot fathom has here been cropped to 1.78:1. This is not just a technical complaint – the results of the crop are frequently obvious and often disruptive to your appreciation of the movie. Heads are cut in half and occasionally characters are complete excluded from shots they are clearly meant to be in. In a gag involving a dusty rag being shaken in Tin's face, for example, we're left to gauge her reaction from the movement of her right shoulder, the only part of her that remains visible during the pay-off, and there's even a small part of Kong's training with Captain that is completely lost to the crop monster. With the action so carefully choreographed to camera there are inevitably sequences where not being able to see the entire frame leads to visual confusion, something that's never an issue with the full scope print. Dolby 2.0 stereo and 5.1 surround tracks are offered, both in the original Cantonese with optional English subtitles. Dialogue is neither as loud or crystal clear as you'd expect on either and the surrounds on the 5.1 track appear to be reserved for music. Both are serviceable tracks, nothing more. A brief montage of behind-the-scenes footage, including a few outtakes and the odd bit of larking about, all set to drippy music. Of interest and rather fun, but a bit short. A mixture of fluffed lines, comic accidents and repeated attempts at single stunts that runs for a reasonable length. Presented letterboxed with the timecode above the picture and – how about this? – in the correct scope ratio. Also included are the Original Theatrical Trailer (1:46) and the Promo Trailer (1:18). Somewhat frustratingly, both are in scope, though non-anamorphic. 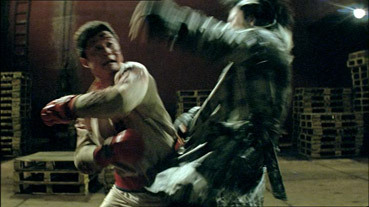 A decently made modern martial arts actioner whose genre-typical one-dimensional characters and by-the-numbers plotting are made perfectly tolerable by a string of smartly choreographed and performed fight sequences, the odd bit of engaging character humour, and the undeniable charm of lead player Jacky Wu. But that picture cropping is a real issue here, and it's impossible to recommend Showbox's UK release DVD to genre fans when there's a US 2-release from Dragon Dynasty with the film in its correct aspect ratio, a commentary with director Dennis Law and our old friend Bey Logan, a Jacky Wu featurette, a look behind the scenes, and interviews with director Law and co-stars Theresa Fu and Miki Yeung.